The boys are back in town! 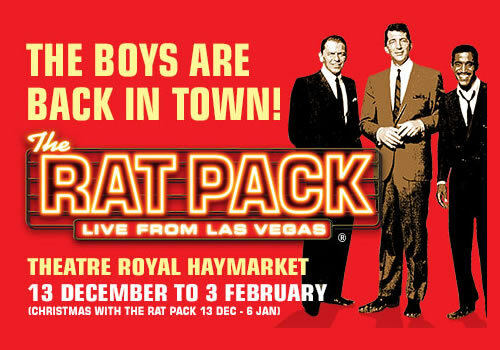 From the company behind the Olivier Award-nominated show The Rat Pack – Live from Las Vegas comes Christmas With The Rat Pack, a wonderful winter extravaganza! Dance back to the swingin’ 60’s with this critically acclaimed production that celebrates three of the world’s most famous entertainers. Playing a strictly limited season at the Theatre Royal Haymarket, experience the perfect Christmas in the heart of London! Christmas With the Rat Pack was last seen at Wyndham’s Theatre and has since become an international success. Documenting the iconic trio, who appeared in Hollywood films and rubbed shoulders with America’s President, the show reels of some of music’s, and Christmas’s, biggest hits. Join Frank Sinatra, Sammy Davis Jr. and Dean Martin as they serenade audiences through the night. Set at the world-renowned Sands Hotel, the show recreates the band’s famous 1960’s gig, featuring the Rat Pack Big Band. Throughout the Christmas season, classics such as “White Christmas”, “Jingle Bells”, “Winter Wonderland”, “Rudolph the Red Nosed Reindeer”, “Let it Snow” and more will be heard, alongside mega-hits including “Witchcraft, “The Lady is a Tramp” and “That’s Amore”. Produced by Paul Walden and Derek Nicol for Flying Entertainment and TRH Productions, Christmas With the Rat Pack is directed and choreographed by Mitch Sebastian, and will be followed by The Rat Pack – Live from Las Vegas. A hugely entertaining show guaranteed to thrill fans of the classic music, the production runs from December 13th 2017 to January 6th 2018 at the Theatre Royal Haymarket, before continuing its UK tour. Christmas With the Rat Pack is suitable for all ages.